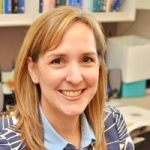 Monica Roosa Ordway, PhD, APRN, PNP-BC is an assistant professor at Yale University School of Nursing where she teaches community health in the Graduate Entry Prespecialty into Nursing and Masters programs. Her research interests include the assessment of psychosocial and biological variables that influence early parent-child interactions and the development of the capacity for parental reflective functioning (RF). Her current research is focused on examining sleep, stress, and health among toddlers living with socioeconomic adversity. Her research goals include evaluating programs using a biological-psychosocial profile in order to translate programs for practical and sustainable use within pediatric clinical settings with the aim of mitigating the effects of toxic stress and the development of subsequent risk factors that lead to chronic illnesses. Dr. Ordway is also a pediatric nurse practitioner and board certified lactation consultant with almost 20 years of clinical experience. Infant mental health is an interdisciplinary professional field of inquiry, practice and policy, concerned with alleviating suffering and enhancing the social and emotional competence of young children. The focus of this presentation is to highlight the importance of supporting the relationships between infants and toddlers and their primary caregivers to ensure healthy social and emotional development. Considering the increasing understanding of the impact of toxic stress on the lifelong health of very young children, it is critical that we identify methods to buffer the experience of toxic stress on children beginning at the earliest stages of life. Without appropriate regulation from a supportive caregiver, exposure to toxic stress in early childhood can result in wide-ranging physiological disruptions, including alterations in mental health. This presentation will provide an overview of infant and toddler development, the toxic stress literature, and provide important information on how to screen and assess infants (and toddlers) and their families for risk and protective factors that may trigger or buffer the effects of toxic stress.